Refugee mothers and their babies from South Sudan queue at a health centre located near the Nyumanzi refugee camp, north of Adjumani town in northern Uganda. Fighting between armed groups and Government soldiers and an apparent breakdown in law and order in South Sudan’s Western Equatoria state, with hundreds of houses burned down or looted, has uprooted 15,000 people over the past five weeks, and 500 a day are now pouring into Uganda, the United Nations refugee agency reported today. "Sporadic gunfire is commonplace, and there has also been an increase in crime involving car-jackings, attacks on Government property, looting of civilian homes and sexual assaults reportedly by armed youth," UN High Commissioner for Refugees (UNHCR) spokesperson Adrian Edwards told a news briefing in Geneva. “Overall, these are alarming developments for a region of South Sudan that has until now been relatively stable,” he added. The country, which only gained independence in 2009 after breaking away from Sudan, its northern neighbour, was thrown into turmoil when conflict erupted between President Salva Kiir and his former Vice-President Riek Machar two years ago, killing thousands, displacing over 2.4 million people, 650,000 of whom fled abroad, and impacting the food security of 4.6 million. Just last month the Security Council increased the strength of the UN Mission in South Sudan (UNMISS) by over 1,000 to a ceiling of 15,000 troops and police, citing protection of civilians “by all necessary means” as its top priority after repeated ceasefire violations by both the Government and opposition undermined UN and regional efforts to restore peace and stability. Mr. Edwards reported that a recent UN mission to Yambio, 300 kilometres west of Juba, the capital, found nearly 200 houses burnt down and several hundred others looted. People have taken refuge in the town centre or moved to nearby villages. UN estimates put those displaced in Western Equatoria’s Yambio and Tambura counties at 15,000 since the start of December. The violence is also driving people to flee hundreds of kilometres to the southeast to neighbouring Uganda where 500 refugees have been registered every day since the beginning of this week – a quadrupling in recent numbers. As well as the violence, refugees cite food insecurity due to failed crops as a reason for their flight. Last month, UNHCR reported that fighting in Western Equatoria, which until then had been spared much of the violence that has hit other parts of the country, had displaced over 4,000 people into a remote region of north-eastern Democratic Republic of the Congo (DRC). As of 6 January, registered new arrivals, most in the Dungu area, had risen to 6,181, some 4,164 of them South Sudan nationals and 2,017 Congolese, who had been living as refugees in South Sudan. The influx there has continued into 2016 but at a much reduced rate, with the Government refugee agency recording 268 in the past week. The implications for humanitarian access to an estimated 7,400 refugees living in Western Equatoria are very worrying, Mr. Edwards said. UNHCR is in contact with Government authorities regarding the security of those refugees and has agreed on additional UNMISS force protection through increased patrols as well as support to relocate refugees to safer areas. 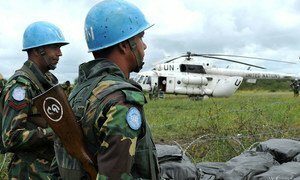 The Security Council today increased the United Nations peacekeeping force level in strife-torn South Sudan by over 1,000 to a ceiling of 15,000 troops and police, and extended its mandate for another six months, citing protection of civilians “by all necessary means” as its top priority.